A recent claim to fame for Loom & Leaf was occasioned by the U.S. visit of Pope Francis. Saatva was one of the companies providing mattresses for the papal entourage, especially in the New York City area. The mattress the Pope slept on was a Loom & Leaf. • The flame retardant in the organic cotton quilted cover is natural thistle. • A gel pad is laminated to the middle portion of the top foam layer to give additional support to the lower back and cooling to the warmest part of the body. • The top foam layer is infused with swirls of liquid gel instead of beads. • The memory foam and the support foams are advertised as “plant-based.” At least one reviewer said this makes the foam cooler, but that is not confirmed by testing. • L&L is one the brands using a transitional support layer. • The support base is described as having air channels for cooling. The cover fabric on the Loom & Leaf is organic cotton. Here is one of Saatva’s claims to making more healthful mattresses. Cotton is breathable and durable. In L&L, it is quilted to a ⅝” thick sheet of foam. 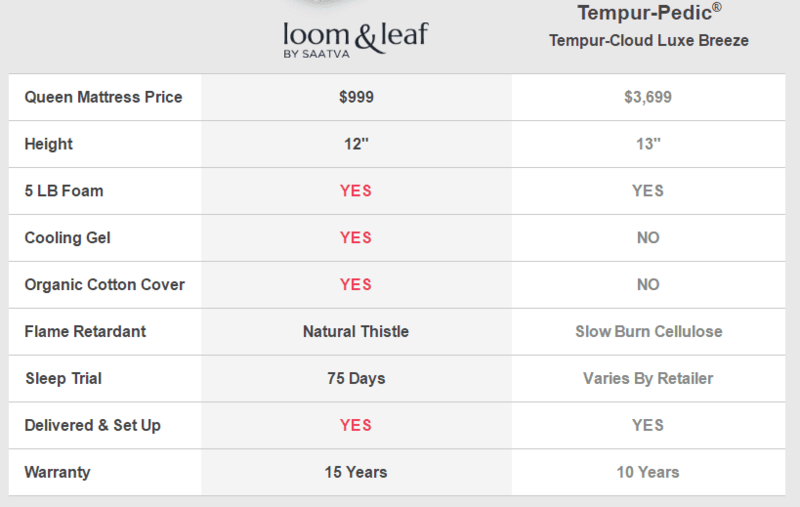 In a comparison chart, the flame retardant is listed as “Plant-based Natural Thistle,” while that of Tempur-Pedic is called “Slow Burn Cellulose” (meaning silica-infused rayon). There is no other explanation of what the thistle is. The gel pad on top will help provide semi-fluid support to the lower back. This concentration of gel will also provide more effective and longer-lasting cooling than gel beads in foam. It can absorb more heat than beads. Continuous gel can conduct heat away from the sleeper more effectively than unconnected beads. Likewise, liquid gel swirls in the 2” top foam conduct heat more effectively than beads. The integrity of the foam may be better with swirls than with beads, but that remains to be confirmed. The lower side of the gel foam is convoluted. This allows air to flow between this layer and the memory foam beneath. The gel can also release heat into this air. The convolution also provides a mechanical form of conformity. The 2½” layer of memory foam has a 5-lb. density. This is the same as the second layer in the Tri-Pedic memory foam mattress. This density is more heat-sensitive, therefore more conforming, than lower density memory foam. Putting it beneath the top layer keeps its accumulated heat further from the sleeper, a role shared by the convolution above it. As to being “plant-based” foam, there is a limit to how much petroleum can be replaced by soy or other plant oils without compromising the properties of the foam, whether polyurethane or memory foam. Dr. Rick Swartzburg addressed this in his article What About Organic or Green Memory Foam? Several foam mattresses use a transitional support layer between the base support layer and the comfort layer(s). Except in all-latex models, this is polyurethane foam with a firmness midway between the very firm support base and the softer comfort foams. This makes it easier for two foams with drastically divergent firmness to work together. It also may prolong the life of the comfort layers. The transitional support layer in Loom & Leaf is 2” high. Air channels for cooling did not begin with Loom & Leaf. Assuming airflow through the upper layers, it only makes sense to channel it to the edge where it can be exchanged with room air. This has been a feature of the Airflow Transfer System, which is an option for Tri-Pedic mattresses, and a standard feature for TempFlow models and the Snuggle-Pedic Mattress. So far, Loom & Leaf by Saatva has a very good customer response. The prices of their mattresses are lower than the equivalent Tempur-Pedic, Sealy Optimum and Serta iComfort models, but they are generally higher than most online bed-in-a-box offerings, especially when the cost of delivery is factored in. But for their customers, it appears that it is worth the cost. 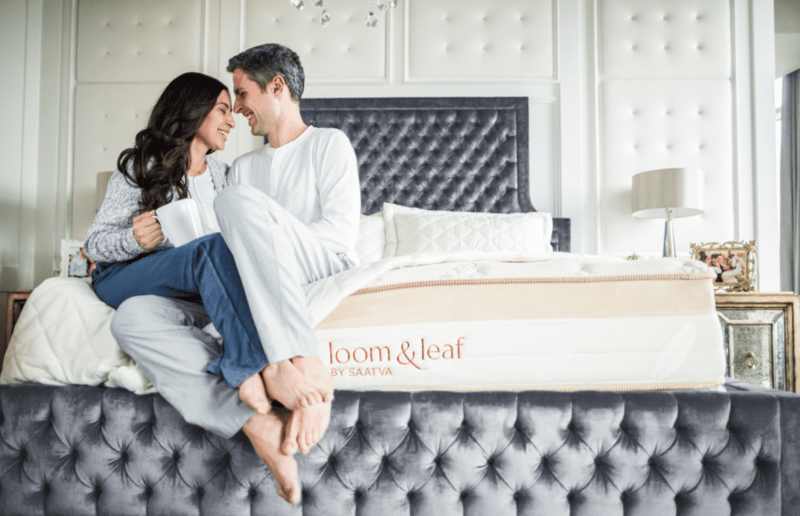 The Sleep Like the Dead evaluation of mattress owners’ views showed that Loom & Leaf has as high or higher owner satisfaction as its main competitors, which is greater than the average rate for all mattresses. It also did better on price/value, sleeping hot, off-gassing, and having to add a topper.